Thunder Tea Rice 擂茶 is a traditional dish among the Hor Poh 河婆 clan which is part of the Hakka's 客家. This dish bound to have mixed responses. If you don't like it, you'd rather settle your meal with a pack of instant noodle. But if you are the person who know how to appreciate this dish, you will get hooked on it and started to tell others how wonderful this dish is. Lower cholesterol, detoxify the body, aid digestion, lose weight, clear complexion and the list goes on. My maternal grandma 外婆 always told me about the goodness of eating Thunder Tea Rice. Lose weight is something that she always highlight to me. Haha.. I grew up Hor Poh Family. My mother is Hor Poh 河婆, and now, my husband's family too. That's when my parents working overseas to make a living, I was taken care by grandma since young. My grandma used to cook this often. This is how my knowledge of Thunder Tea Rice comes from. My grandma has 12 childrens (5 sons and 7 daughters). All my uncle and aunts will gather at my grandma's house and cook this dish together. The last time was during my teenage time, should be somewhere around 13 years old I guess. And that was the last time. I suddenly miss my grandma so much. Sigh! People don't make this at home anymore. Because they think this dish is too troublesome. Too much ingredients to buy, and youngsters don't really appreciate such traditional food as we do. Another reason why this dish is being slowly forgotten is probably due to the complexity of preparations. Modern people tends to measure the amount of ingredients purchased and prepared vs the amount of people gathered at home to enjoy this dish. Small families? It's just not worth the effort of preparing. That's sad. 3 years ago, because I missed my grandma so much, I walked to Lau Pa Sat (Singapore Festival Market) and bought a bowl of Thunder Tea Rice that cost me S$5.00. Look at the bowl of rice that they served me, it's like.... prison food? Well, perhaps it looked more like hospital food. After my grandma's passing, the more I knew I won't have the opportunity to eat this anymore. Well, we can still get it outside, but it's just taste different lah. There's still hope in Malaysia, as Malaysia's shop-bought thunder tea rice definitely taste better than Singapore's one. I'm pretty sure. Traditionally, this dish calls for 7 types of vegetables and 5 condiment. Those shop-bought one's won't give you the complete traditional ingredients! The most, shop-bought one's gives 4 types of dishes (combination of vegetables and condiments). 5 if you are lucky. Sigh! Other than me, no one in my maternal grandma's family bother to learn this dish. No one. During my trip back to our hometown (Ipoh / Kampar), I've got this ultimate traditional equipment to make the tea soup for this dish. When I saw it, I was like "Whoaaaa~!!! Precious~!!!". Mad happy! Hahaha... Well, this is inherit by my Father-In-Law's grandma. And since I'm the Daughter-In-Law, I'm now the owner of the 4th generation. I wonder if my future child will appreciate this thing if I were to pass it down next time. I've written this recipe according to the combination info from Max's eldest aunt (大姑妈) and my mom's. 大姑妈 happened to come to Singapore for a few days, and stayed over at my place. So, I grab this opportunity to squeeze her time to teach me this. I did a comparison between 大姑妈's recipe with my grandma's recipe, which I ask my mom for my grandma's recipe over the phone. They are almost 90% the same. Except my grandma's version do not have fried anchovies for the soup. I hope my mom didn't remember wrongly. This dish is basically plain rice, topped with veggies, condiments and drenched with tea soup. This recipe is only 99% complete. Not 100%. Because I couldn't get the herb called 'Fu Lit Sum' (苦列心) in Singapore. I don't know what is it called in English. Probably they have, but I just no luck on it. If you are making it at home, try to hunt for it. This ingredient will be separated into 3 part. The tea soup, 7 types of vegetables and the 5 condiments. *At first, I thought 'Fu Lit Sum' was Yomogi. But luckily Wendy told me that it is not. Please let me know if you know what is the english name of this herb. Ok? 250gm French Beans 四季豆 + 15gm Dried Shrimps 虾米, but dried shrimps is optional. *Usually, Long Bean 长豆 is used. But we prefer the crunchiness of french beans instead. So, it's fine if you wants to use either French Beans or Long Beans. 250gm Toasted Peanut 烤花生, or more if you want. Lots of things to prepare eh? Indeed. But well, if you are feeding a family of 5 or more, this is worth the effort. I really encourage you to do it. Stay cool, follow the flow, and you won't go wrong. Soak black-eyed pea in water - This need to be soaked the night before. Rinse vegetables, separately. And cut them into small piece if needed. Set aside. Rinse preserved sweet radish and dried shrimps, separately. Drained. Set aside. Fry anchovies. Drain it on a kitchen towel, so that it could absorb excess oil. Set aside. Cube the tofu for later pan fry use. First of all, cook a pot of white rice - good for about 5 to 6 person. But I'm sure you could feed about 7, or even more. Now let's make the tea soup first. Usually people won't have the ultimate traditional equipment to make the tea soup anymore. So, please just use your food processor or blender if you don't have it. Blend in the tea soup ingredient, adding in item by item in the order as follows : Luk Bou' Chinese Tea Leaves, Toasted Sesame, Toasted Peanut. Blend it coarsely first. And then, add in Old Ginger and Fried Anchovies. Give it another blend. And finally, add in Thai Basil, Mint Leaves, Manicai and 'Fu Lit Sum' (If you could find them). Blend them into a paste. Set aside for later use. Boil a kettle of water. Once it is boiled, pour it on the tea paste. Give it a good stir. And this is the hot tea soup! Do this only when all the rice, condiment and veggies are ready to eat. Otherwise, the soup will turned cold. Note : You might need to add abit of hot water while you blend the tea soup paste if you are using blender instead of food processor. Food processor tends to be more powerful, I don't think they have problem. I didn't use blender to do the work, so I don't know. Well, you just have to eyeball it yourself. Someone did shared with me that there's a difference in color of the tea soup if you are making it in different ways. 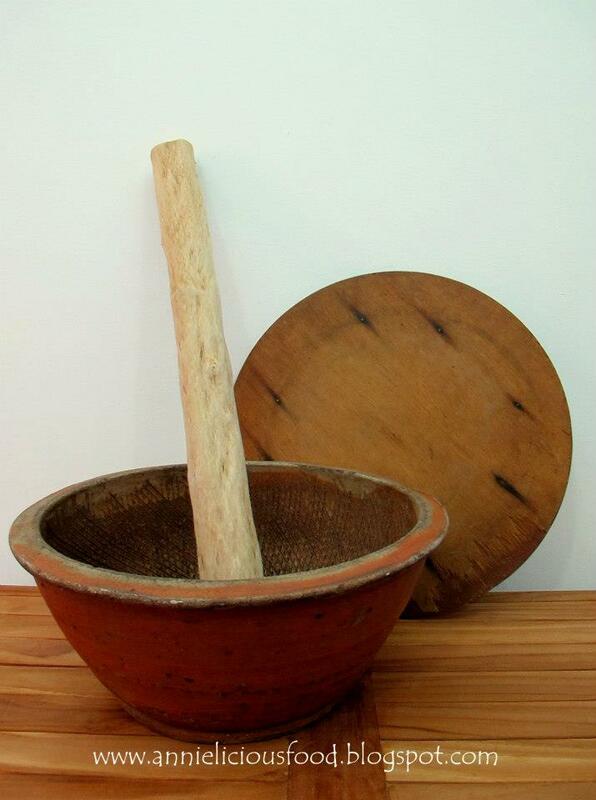 If the tea soup paste is prepared by grinding the ingredients traditionally in the Thunder Tea Rice pot, it will yield a darker brownish green color. If the tea soup paste is prepared in a modern way by using food processor or blender, it will yield brighter green color. For the toasted peanuts - I did it the night before because I know I won't have enough time for that. 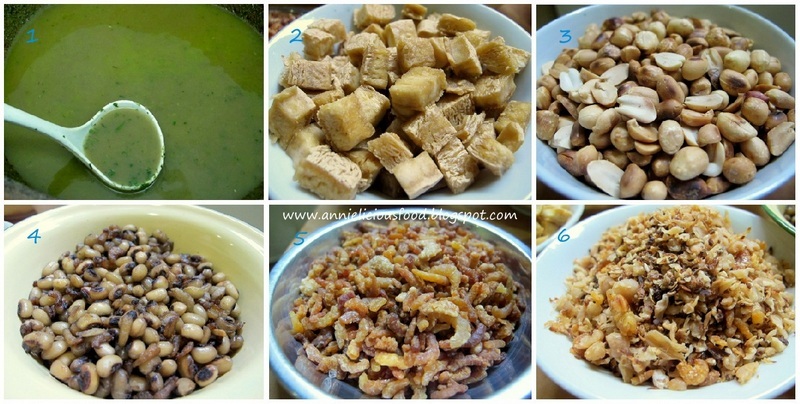 So, pan-fry raw peanuts under low heat, until the peanut skin turn slightly charred, check and try it. If peanut turned crunchy and fragrant, then you are there. Remove from pan, set aside to cool down abit. Rub and remove the peanut skin. Once the peanut is completely cooled, keep it in air-tight container for next day use. For the black-eyed pea - Soak the peas overnight. The next day, wash and drain the peas. In a saucepot, add in half tbsp oil, and dried shrimps, fry till fragrant, and add in the beans and a pinch of salt, fry for awhile. Add in 400ml (or more) water, bring to a boil. Reduce to low fire, let it slowly simmer until the beans are soft to eat and dry. For the pressed tofu - Pan-fry diced tofu under medium low heat until golden brown. Set aside. For the dried shrimps - Fry dried shrimps until fragrant and crispy (but not burnt), drained the excess oil using kitchen towel. For preserved sweet white radish - Heat up half tbsp oil, pan-fry Preserved Sweet White Radish until fragrant and dry. And maybe slightly charred. Dish up and set aside. Note : Cooking black eye peas takes me about 35 to 40mins using normal stainless steel stock pot. So, cook the peas first while you could do other stuffs. If you are using those ultimate pressure pot, the cooking time will be reduced. Do check the water level often. Add water if necessary. Once it's cooked, dish up, set aside for later use. Or if you could, do cook this ahead of time, probably the day before, and then heat up on the next day. It works! For the French bean – In a pan, add half tbsp oil and dried shrimps, fry till fragrant. Add in diced French beans and a pinch of salt, fry until cooked. For Choy Sum, Romaine Lettuce, Manicai, Kai Lan – Cook them individually. In a pan, add half tbsp of oil, add in the vegetables, add a pinch of salt, fry until the veggies just wilted. For Mint leaves and Thai Basil – Combine both together. In a pan, add half tbsp of oil, add in the vegetables, add a pinch of salt, fry until the veggies just wilted. The ingredient for tea soup. Manicai and 'Fu Lit Sum' supposed to be in the in the picture. This is the particular 六宝茶 'Luk Bou' Chinese Tea Leaves meant for Thunder Tea Rice. Do not attempt to use other tea leaves like Tie Guan Yin 铁观音 or Pu Er 谱耳 or OoLong 乌龙 and other high quality tea leaves. Because these expensive tea leaves gives you bitter taste, whereby this cheap Chinese Tea Leaves 'Luk Bou' taste milder and did not gives bitter taste. Keep grinding. This is alot of hard work here.. seriously! This is the tea soup paste is ready to use. I know, modern people use food processor or blender instead. Save all such hard work doing such grinding work manually. It's tiring. But the "feel" of the entire cooking process is just different lah. It's simply nostalgic! The Tea Soup and the Condiments. Done! 2. Pan fried pressed tofu. The 7 Vegetables. Done too! The 'master chef' is preparing the tea soup. She warned me not to post her photo online. LOL! This is the final assembly. Scoop some white rice, and then topped with all the veggies and condiments. Pour a bowl of tea soup, mix, and tuck in! I can eat two bowls of this.. easily. You call this messy! No. I call this characteristic! Wuahahahaha! Ok, I know the appearance of this mixed rice dish might looks not appealing to some people. But I have to assure you that it wasn't that bad. Peanuts, radishes, dried shrimps and other condiments goes very well with the rice. The overall fragrance of the tea soup is simply indescribable! You must try this AT LEAST once in your life! Phong Hong, you stay too faraway lah! LOL! I've tried this once at a friend house and I really like it. This is a lot of working for making a meal but there looks real scrumptious!! I've seen my Hakka friend made this and she just put everything in a blender :) I managed to find the Thunder tea powder in a packet but not sure how good is it as I have yet to try it out. Hi! please help ! I'm trying to look for that pot to make thunder tea rice. If anyone know where I can get it please email me at, dakota.yeo@gmail.com preferably in Singapore or JB (malaysia) or Malacca (malaysia) Been trying to find this for a long time :( Please help. I miss making this Thunder tea rice!! Hi, I am also a great fan of 雷茶 though I am not a Hakka. Base on my research and interviews I had with some Hakka friends, I am guessing that different Hakka families have their own bowl of special 雷茶 brew, of which the main 4-5 basic herbs are the "must-have", namely: thai basil ( (九層塔), mugwort (艾草), 苦力心, mint (薄荷叶), sawtooth coriander (刺芫荽). On top of these there will be a few more herbs added by each respective family as part of their "secret ingredients". You can get the common herbs (for 80cts to S$1 per bunch) from Tekka Market, except for 苦力心, which is more common in Malaysia. BTW, the botanical name for 苦力心叶 is Trifoliate Acanthopanax. Thanks for sharing this traditional dish that me and my family loves so much. I love the way you presented the recipe, with beautiful photos and detailed description. I can't wait to try making it during the Sep holidays for my family. May I find out if there is any place where I can find the pot and the guava stick used in preparing the tea mixture? Hi Neo, If you are staying in Singapore, it would be pretty impossible to get it. I'd pretty sure that Malaysia still selling the "pot". But for the guava stick, you will need someone to find it for you. I'm seriously not sure. Hahaha.. I am living in Africa with my family and we are going to make Thunder Tea Rice this Friday. Can u tell me if the wooden bowl is also made of guava tree? I have a guava tree which I can cut the branch for the stick, but the bowl may be difficult to make out of a guava tree..
Do you have idea where can I get the pot n stick to prepare the thunder tea rice? I really want to try preparing since my husband is a big fan of it....or any chance that you will be going back to your hometown? Maybe can help me see any idea to find 1.... Hope to hear from you soon. Hi Annie, I like your presentation very much. On the tea soup we also use 大风河，蒲kian. This unnamed herb is kulixin or acanthopanax trifoliatus, a plant with ginseng like properties. Hope this helps. i read this post by accidence.i like your post.its very detail.i found out that the recipe is similar as my granny made too.i miss my granny thunder tea rice.i really thankful that i found ur blog. this is a recipe to keep! i didn't know how to appreciate this dish till much later in years. now my granny is too old to do it. I am now in search for the guava stick/stem. where can I find in JB? i frequent JB but not sure where i can find one. can you advise? thanks.